Abstract: Like Proverbs, Jeremiah and Daniel, the book of Ezra has been transmitted in two recensions: Ezra-Nehemiah in the Hebrew Bible and 1 Esdras in the Greek Bible. Each version has its own distinct literary shape. Both editions overlap in the account of Zerubbabel's temple building and Ezra's mission. In addition to this common material both versions contain special property: 1 Esdras starts with the last two chapters of Chronicles (Ezra MT only with the last verses) and includes the so-called guardsmen story, a Zerubbabel legend not found in Ezra-Nehemiah. On the other hand Ezra-Nehemiah contains the account of Nehemiah's city building lacking in 1 Esdras. The article shows that this last difference in literary shape is connected with a whole series of small textual differences between the overlapping material of two versions which therefore betray themselves as being part of an intentional recension rather than scribal errors. The Zerubbabel and Ezra account of 1 Esdras does not expect a coming Nehemiah story whereas MT's Zerubbabel and Ezra text is compatible with the following Nehemiah account. - Ezra-Nehemiah (MT) begins with the two last verses of Chronicles. 1 Esdras begins with the two last chapters of those books. - The correspondence with king Artaxerxes and the account of Zerubbabel's return to Judah have changed positions in the two versions. - 1 Esdras contains the story of the three guardsmen (a Zerubbabel legend) lacking in Ezra-Nehemiah. - On the other hand Ezra-Nehemiah contains the story of Nehemiah's city building lacking in 1 Esdras. Both versions share the narration of Zerubbabel's temple building and the Ezra story. Critical research tended to consider 1 Esdras as a whole either as a later compilation of texts from Ezra-Nehemiah, Chronicles and the guardsmen story or as the original ending of the Chronicler's work (with or without the guardsmen story). Now the four differences in literary shape may be connected to each other, but they are not necessarily so. The relationships between them have to be examined for each case separately. On the other hand the numerous small textual differences between the overlapping parts of the two versions have not been sufficiently taken into consideration in literary criticism.' Hardly ever has a variant on the text critical level been linked to the literary differences. Ezra 4:21 is a noteworthy exception. In Ezra 4 (1 Esdras 2) king Artaxerxes prohibits the rebuilding of Jerusalem. In the MT however he adds a reservation which is lacking in 1 Esdras: "this city may not be rebuilt until the decree is issued by me". To the categorical claim 22 it will not fit well with that 21 ultimately abolishing the ban on the construction makes it appear as possible, we will ... the words ‘from my command is given' which 1 Esdras has not as a later addition in terms of the granted Nehemiah [Neh 2.4 ff] view permission. Rudolph rightly connects the small text critical issue here with the bigger differences in literary shape. Ezra-Nehemiah (MT) needs this small reservation because it contains the Nehemiah story which will narrate the reconstruction of the city with the king's consent. 1 Esdras lacks both. This version preserves, as Rudolph correctly remarks, the more original text of 1 Esdras 2:23/Ezra 4:21. It does so because it simply does not know about a following Nehemiah story. The complicated growth of the books of the Bible created situations in which textual witnesses reflect different stages in the development of the books and thus contribute to literary rather than textual criticism. Our working hypothesis is to separate the two types of evidence [scil. accidental mistakes and intentional reworking] with a quantitative criterion which also has qualitative aspects. It is assumed that large-scale differences displaying a certain coherence were created at the level of the literary growth of the books by persons who considered themselves actively involved in the literary process of composition. 1) These variants form a coherent series. It betrays systematics. 2) This series of variants is related to the overall literary shapes of the two versions. Having been informed about the scandal of the mixed marriages, Ezra recites the long prayer of Ezra 9. First he thanks God because the Jews were able to - I quote MT: "erect the house of our God and rebuild its ruins." Ezra is looking back on the reconstruction of the temple, nothing else. In 1 Esdras however he says: "erect our temple and rebuild the ruins of Zion." In 1 Esdras Ezra is looking back on the rebuilding of the temple and of the city of Jerusalem! The city of Jerusalem has already been rebuilt! This is not an isolated variant. While Zerubbabel is rebuilding the temple, the governor Tattenai comes along for an inspection. According to the Masoretic text he writes to the Persian king: "We went to the province of Judah to the temple of the great God, which is being rebuilt." According to 1 Esdras however the governor reports: "We went to the province of Judah and came to the city of Jerusalem. We found the elders of the exiles of the Jews in the city of Jerusalem rebuilding the great temple of God." building an house unto the Lord, great and new, of hewn and costly stones, and the timber already laid upon the walls. And those works are done with great speed, and the work goes on prosperously in their hands. According to 1 Esdras Jerusalem was already rebuilt in Zerubbabel's time. Tattenai finds the restored city. Whereas in the MT he finds no city but a temple construction place in the province of Judah. Both editions state that the exiles returned to "Jerusalem and Judah" (Ezra 2:1; 1 Esdras 5:8). But when they settle down 1 Esdras says (5:45): "The priests and the Levites and some of the lay people settled in Jerusalem and the province. The singers however, the gatekeepers and all (the other) Israelites in their towns." Zerubbabel finds the rebuilt city. The clergy and part of the laity can at once move to Jerusalem. The situation in Ezra-Nehemiah is quite different: "The priests and the Levites and part of the lay people and the singers and the gatekeepers and the temple servants settled in their towns and all the rest of the Israelites in their towns" (Ezra 2:70). So the priests, and the Levites, and some of the people, and the singers, and the porters, and the Nathinim, dwelt in their cities, and all Israel in their cities. Settlement in Jerusalem does not yet take place in the Masoretic text. That will be Nehemiah's task in his famous settlement (Neh 7:4--5 and 11:1ff). 1 Esdras presupposes in the following, that Jerusalem is inhabited in Ezra's time. After Ezra's prayer "a very large crowd from Jerusalem" gathered around him (1 Esdras 8:88). Not so in MT: here gathers "a very large crowd from Israel." So when Esdras had prayed, and when he had confessed, weeping and praying before the house of God, a very great assembly of Israel came together to him, men and women and youths; for the people wept, and wept aloud. This is the conception of Ezra-Nehemiah: the city especially its gates are in ruins until the arrival of Nehemiah. It's Nehemiah who will rebuild the gates of Jerusalem (Neh 2:8; 3; 7:1.3). That is the presupposition of the Nehemiah story. The Masoretic Ezra text complies with this supposition: there is no rebuilt city of Jerusalem and there are no gates. After their settlement the exiles gather for the reconstruction of the altar. According to 1 Esdras they come together "on the square of the first gate facing the east" (5:46). That is not possible in Ezra MT. In fact here it says: "in Jerusalem" (2:70.) According to Ezra-Nehemiah there can be no gate in Jerusalem. and the people assembled as one man at Jerusalem. 1 Esdras doesn't see any problem to talk about gates at the time of Zerubbabel. After the dedication of the temple both versions notice the participation of the clergy: priests and Levites gather in divisions for the service. 1 Esdras continues: "and the gatekeepers at every gate." Such a remark is not yet possible in MT. It is lacking. Both versions do speak of active gate keepers. But 1 Esdras knows them already at the time of Zerubbabel. 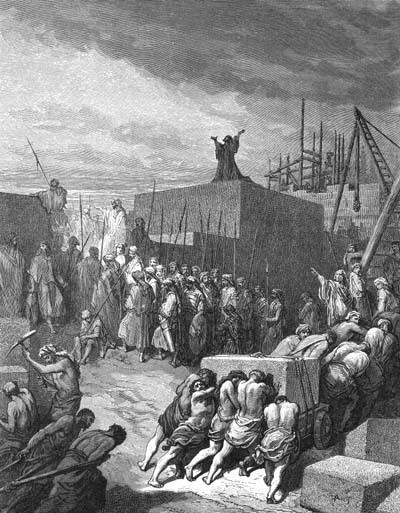 Ezra-Nehemiah will not mention them before the accomplishment of Nehemiah's wall building (Neh 7:1; 10:40; 11:19; 12:25.45). Ezra-Nehemiah reserves all gates, including the temple gates (2:8), for Nehemiah. That means, of course, that the temple didn't have a temple court, a walled precinct before Nehemiah in MT. In 1 Esdras it does: "Ezra got up from the court of the temple" (9:1). MT however: "Ezra got up from before the temple" (10:6). The temple precinct with its gates does not yet exist in MT. All these minor and major variants form a coherent series. Every single one could be considered accidental. The series is no accident. It shows intentional reworking. The tendency of all these differences always goes in the same direction. 1 Esdras again and again presupposes by the way that (1) the city of Jerusalem is rebuilt at the time of Zerubbabel and Ezra, (2) that the returning exiles can at once settle down in it, and (3) that the temple is furnished with a walled precinct, gates and active gatekeepers. All remarks of this kind are systematically lacking in Ezra MT. The rebuilding of Jerusalem, settlement in the city, reconstruction of the gates and institution of gatekeepers - all these will be Nehemiah's achievements. Whereas the Masoretic Ezra text is compatible with the following Nehemiah story, 1 Esdras is not. The text of 1 Esdras is not prepared for a following Nehemiah account. The question whether 1 Esdras left out Nehemiah's story or the other way round Ezra-Nehemiah (MT) inserted it cannot be answered on direct literary critical grounds. On these grounds both directions could be conceived and have actually been proposed. But as I have shown it is not just a question of simply omitting or adding a story. The whole text of the Zerubbabel and Ezra stories had to be adapted to the omission or addition of the Nehemiah account. That makes feasible an indirect access to the answer. If Jerusalem has been secondarily reduced to a state of ruins in the Masoretic text; if the repopulation of the city has been secondarily postponed, then this version is a later adaptation in order to become Nehemiah compatible, and then also 1 Esdras represents an older stage of the textual and literary development of Ezra-Nehemiah. My thesis is that this is indeed the case: the Masoretic Ezra text has been prepared secondarily to fit with the inserted Nehemiah story. Quite often the apparatus of the BHS notes the priority of the text of 1 Esdras. Ezra 5:8 e.g. as compared with 1 Esdras 6:8 deleted the mention of "the city of Jerusalem." Even in the Masoretic version the continuation of the letter refers back to the elders (Ezra 5:9), mentioned in 1 Esdras 6:8, now lacking in Ezra 5:8. The omission cannot be explained technically, it is intentional. The twofold mention of "the city of Jerusalem" was not tolerable any more because of the insertion of the Nehemiah account. The same applies to Ezra 2:70, where MT deleted "Jerusalem and the province" (compare 1 Esdras 5:45). We still have in MT two series of settlers in descending rank: (1) higher clergy and part of the laity, (2) lower clergy and the rest of the laity, but it is not understandable any more, why two series of settlers had to be distinguished, why part of the laity and the rest of the laity had to be opposed to each other. The twofold city does not give the necessary disjunction, which once consisted in the distinction of settling places: Jerusalem and other towns. Ezra MT had to omit "Jerusalem" to make room for Nehemiah's settlement. The gate of 1 Esdras 5:46 has been deleted in Ezra 3:1, but is still preserved in Neh 8:1. Most of the aforementioned variants of the Masoretic text can be shown to be secondary on text critical grounds. The decisive point is however, that only the assumption of a systematic recension does really explain all these variants, their coherence and clear-cut tendency. Every single passage of 1 Esdras that had been talking about the already rebuilt city, its repopulation and about its gates has been systematically reworked. Why? To prepare a Nehemiah-compatible text of Ezra. This reworking shows that the Nehemiah story has been inserted later into the restoration account. Originally Neh 8 (Ezra's reading of the Law) followed directly Ezra 10 (Ezra's action against mixed marriages) and concluded the whole restoration narrative. 1 Esdras preserves this older text arrangement. The revisor combined the old restoration account 1 Esdras (without the guardsmen story) with the so called Nehemiah Memoirs. These comprised more or less the passages in the first person singular, that is Neh 1-6* and 12*, 13*. These Memoirs had still been circulating independently from the restoration account (Zerubbabel and Ezra story) for a long time. Even Josephus still knew them in the 1't century A.D. In his Jewish Antiquities XI 1-158 he first tells the story of Zerubbabel's temple reconstruction and the Ezra account following closely 1 Esdras (including the guardsmen story). Only then (after Ezra's death in Ant. XI 158!) he continues in Ant. XI 159-183 with a Nehemiah story as he knew it: it comprises exactly what we still have in Neh 1-7:3 and 12*-13*, that means the so called Memoirs, which were still much shorter than our book of Nehemiah (lacking chapters 7-12*) and certainly were not yet integrated into the whole of Ezra-Nehemiah. The redactor who wanted to insert the Nehemiah Memoirs into the older restoration account reworked the old Zerubbabel and Ezra story (1 Esdras) to make it Nehemiah compatible. He then inserted the wall building account Neh 1-6 placing it before Ezra's Torah reading. Neh 7 is a repetition of Ezr 2, Neh 9-12 are the redactor's material. The end is again taken from Nehemiah's Memoirs (Neh 12 and 13). The redactor has created an entirely new work with a well defined structure. The word wall dominates Neh 1-6, then disappears and reappears with the dedication of the walls in 12:27ff. The construction of the wall is the outer frame. The lists in Neh 7 and 11 are the preparation and carrying out of the repopulation of Jerusalem. The core is Neh 8-10 under the leitmotiv "Torah." Within the frame of Nehemiah's walls the exiles can settle down, and Israel can constitute herself on the basis of the Torah. Obedience to the Torah is not possible without the organizational frame of a visible societal body. The two restoration accounts define in a narrative way the essentials of Israel: what is to be restored, so that Israel can be called restored? The old story 1 Esdras said: temple and Torah obedience. The new edition says: temple, Torah obedience and social organization of the people of God (symbolized in the City). A last remark on the possible date of this new recension of the restoration account. Various indications point to the second century B.C.E. for this reworking. The dates of Neh 1:1 and 2:1 which make Kislew precede Nisan of the same year presuppose the Seleucid autumnal year. The extension of Judah according to the city list of Neh 11 was achieved only in Maccabean times. The prayer of Neh 9 cries for political sovereignty which fits Maccabean aspirations. 2 Macc 2:13f reports about Nehemiah's (!) and Judah the Maccabee's literary efforts. Kellermann and Blenkinsopp speak of a "Nehemiah renaissance" under the Maccabees. In any case the new version Ezra-Nehemiah would better substantiate the Maccabean aspiration for political independence than the old edition did.